Quality Guarantee: If It's on the Label, It's In the Bottle! To get BIG quickly, you need to consume lots of calories and protein. The problem is that those desiring to gain weight have a tough time getting all the calories and nutrients they need from food alone. 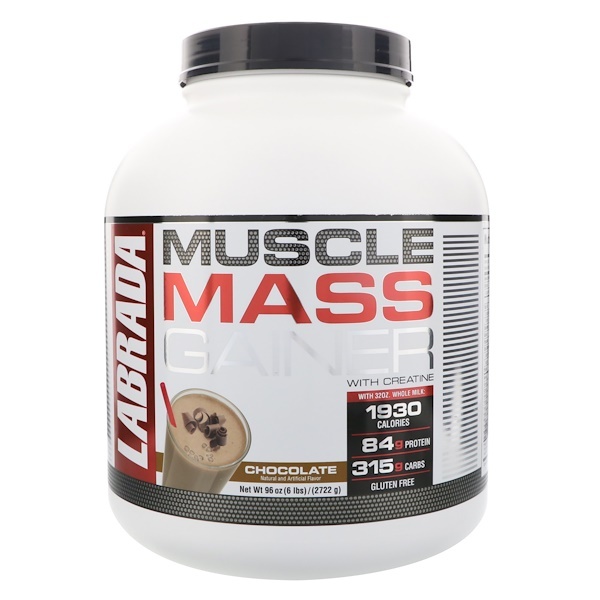 Muscle Mass Gainer was created by Labrada as an all-in-one protein shake for "hard gainers," those who find it hard, or next to impossible, to gain weight. Muscle Mass Gainer contains a highly-concentrated 1930 calories, 84 grams of protein, and 315 grams of carbs when mixed with 32 oz of whole milk! Muscle Mass Gainer makes it easy for you to get lots of calories and the highest quality muscle-building protein for gaining weight fast, in one delicious shake. 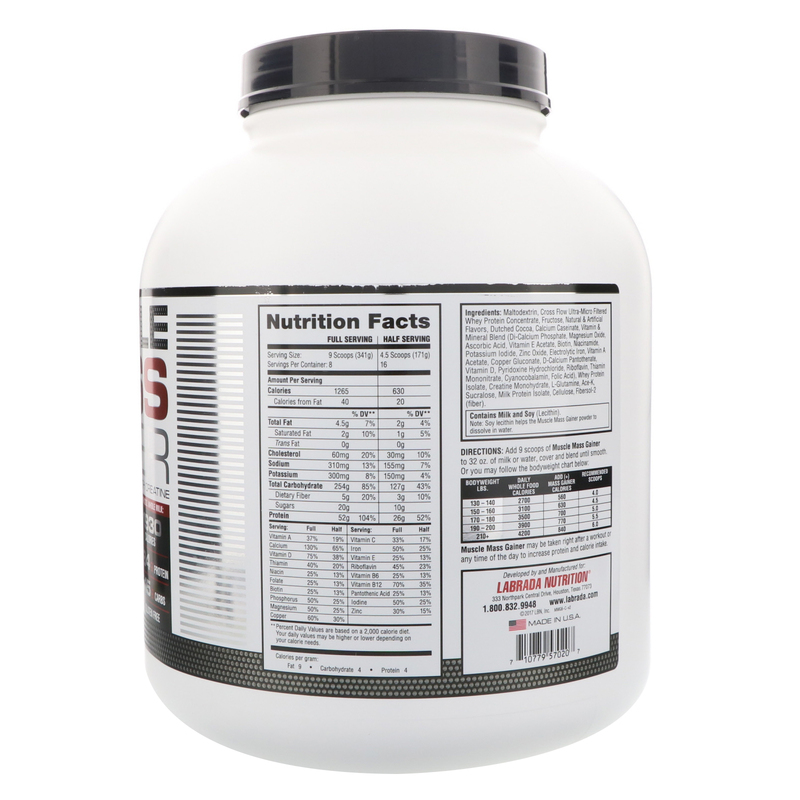 Muscle Mass Gainer contains no dextrose, sucrose, or corn syrup solids. Muscle Mass Gainer can be used as a meal, or as a post-workout drink. It's a high calorie body building food fortified with muscle-building protein, carbohydrates, creatine and essential nutrients. Muscle Mass Gainer may be taken right after a workout or any time of the day to increase protein and calorie intake. Maltodextrin, cross flow ultra-micro filtered whey protein concentrate, fructose, natural & artificial flavors, dutched cocoa, calcium caseinate, vitamin & mineral blend (di-calcium phosphate, magnesium oxide, ascorbic acid, vitamin e acetate, biotin, niacinamide, potassium iodide, zinc oxide, electrolytic iron, vitamin a acetate, copper gluconate, d-calcium pantothenate, vitamin d, pyridoxine hydrochloride, riboflavin, thiamin mononitrate, cyanocobalamin, folic acid), whey protein isolate, creatine monohydrate, l-glutamine, ace-k sucralose, milk protein isolate, cellulose, fibersol-2 (fiber). Contains Milk and soy (lecithin). Note: Soy lecithin helps the powder to dissolve in water. **Percent Daily Values are based in a 2,000 calorie diet. Your daily value may be higher or lower depending on your calorie needs.